Karl Klingler is remembered, if at all, for his eponymous string quartet and for having been briefly the violist in his teacher, Joseph Joachim’s own quartet. He had become second concertmaster of the Berlin Philharmonic under Nikisch in the first decade of the twentieth century, the years in which both works in this disc were composed, the Violin Concerto in 1907 and the Viola Sonata in 1909, though by then he had moved on to quartet work. He was to suffer problems with cellists; in the First World War he had temporarily to disband the quartet because his cellist, Arthur Williams – the notes, which omit his name and mistake the position for violist – was interned as an enemy alien and because Klingler himself was drafted for the German army. Then in Nazi Germany his Jewish cellist Ernst Silberstein, again not mentioned by name, was hounded but Klingler refused to give way. The booklet notes imply that Klingler left Germany for Switzerland for good in 1936 but that’s not so; he returned and went into a form of internal exile though was allowed to perform on occasion. Like many players of the time Klingler also composed. His Concerto is a kind of facsimile of the Brahms Concerto. Rhenish horns open the work, followed by ripe lyricism in an orchestral introduction nearly four minutes long. The soloist’s acrobatic pirouettes – Klingler, inevitably, premiered the work with the Berlin Philharmonic – are nevertheless cast in strict sonata form. A recurrent motif binds the first movement and the passagework gives the soloist plenty on which to bite, some of which is so overtly Brahmsian you wonder how much closer Klingler can get. With a songful slow movement and its invariably faster central panel and the giocoso whimsy of the finale, this is certainly an expertly laid out and adeptly orchestrated work. With the folkloric element in the finale, which aims to evoke the Hungarian esprit of Brahms’ own concerto, there is a rise in temperature, and Klingler has the confidence to end his work quietly. What it lacks, however, is thematic memorability though it surely reflects the abiding influence, maybe via Joachim, of a giant figure in German Romanticism. The companion work was a great surprise to me. Klingler was a noted violist as well as violinist, but this is a performance by him and Michael Raucheisen of his own Viola Sonata. There are no recordings dates or locations given but the sound is good and not at all splintery, so I suppose it comes from an early 1940s radio or studio broadcast. 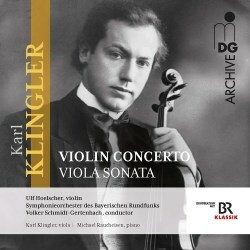 Equipped with a light vibrato and a typical array of expressive devices, including prominent but not over-exploited portamenti, Klingler proves an adept if somewhat hollow-toned exponent of the viola, and sometimes finds it hard to stay precisely in tune in this romantic work. Highlights include a chorale-like theme in what is, in effect, the Scherzo, the songful piano patterns in the slow movement and the corresponding dignity of the viola’s statements and the recurrence of chorale themes in the finale. Again, like the Concerto, this is an expertly laid out work. Ulf Hoelscher is the well-equipped soloist and his working relationship with conductor Volker Schmidt-Gertenbach has its own, smaller-scaled Brahms-Joachim feel to it. They’ve been performing together for decades now. Neither work is a repertoire piece but both shed light on a significant string player.